Tromans has been active on the music scene since the 1990s, performing in over 6,000 concerts on a national and international level, in venues ranging from festival stages to the intimacy of club spaces. He is involved, as band-leader and sideman, in a variety of different ensembles, working across the fields of jazz, improvising music, folk, contemporary, and world. As a composer, Tromans has written in the region of 100 works, with major commissions from Birmingham Town Hall/Symphony Hall, Jazzlines, ZeroKlassikal, and Birmingham Jazz. 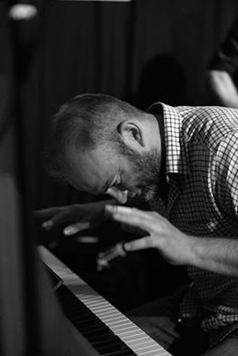 He has featured on BBC Radio Three’s “Jazz on 3” programme, in a special broadcast focused on his Birmingham-Chicago Improvisers’ Ensemble project, bringing together expert improvising musicians from the music scenes in the two cities. In recent years, Tromans has been undertaking practice-as-research in jazz, receiving publication in a growing number of academic journals and books, and delivering lecture-recitals at a series of conferences in the fields of music, philosophy, and performance studies. His central thesis investigates the modes of expert music-making in jazz and improvising music as a form of philosophical enquiry, couched in terms beyond the discursive and operating in the dimensions of the musical. Tromans has released a total of 18 albums to date, with planned further studio and live recordings in 2016 and beyond.